Manchester City Council had been established in 1838. Its first efforts to tackle slum housing came under the terms of a local Police Act in 1844 – the upper classes who dominated local government then viewed the problem as one, primarily, of public order – which banned the construction of new back-to-backs, opened up some of the worst courts and stipulated the provision of more WCs. In 1867, the Manchester Waterworks and Improvement Act went further by giving the Corporation power to declare individual properties unfit and enforce improvement. One year later the city appointed its first Medical Officer of Health, John Leigh. Leigh’s efforts to improve working-class housing were strengthened in 1885 when the Council set up an Unhealthy Dwellings Committee to tackle the problem of the courts. The clearance on Oldham Road followed. In its place, the City Council erected its first municipal housing. Firstly, and most imposingly, came the Victoria Square Dwellings (unofficially known as the Labourers’ Dwellings or colloquially as just ‘the Dwellings’). 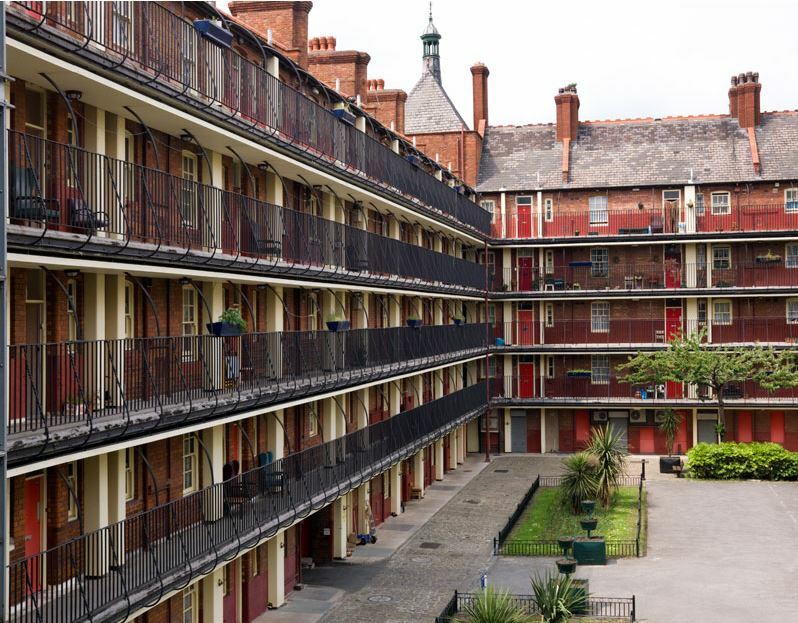 Completed in 1894, from a design by Henry Spalding who had built similar blocks for the London County Council, the Dwellings comprised 237 double tenements and 48 single – 522 rooms in all, built to accommodate 825 persons. Each tenement is provided with a well-ventilated food store and coal locker; dust shoots are provided in convenient positions in the back wall; one WC and sink is provided for every two dwellings, which is a disadvantage; and automatic or ‘penny-in-the-slot ‘ gas meters are supplied to each dwelling. Communal laundry facilities and drying rooms were provided in each of the corner towers. A similar 135-room, five-storey block, Granville Place, was built in Pollard Street though it was even more austere in design. amongst the best in Manchester. The tenants we saw were respectable working people; where they had adequate accommodation they appeared happy, and many had lived there for periods extending up to thirty years. 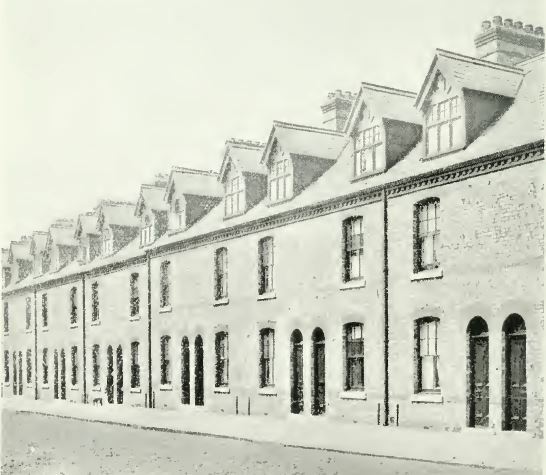 Despite the initial unpopularity of the blocks, the Council had not yet given up on tenements and a series of so-called ‘tenement houses’ were constructed in the same area, largely completed by 1897. The most beguiling of these is the Sanitary Street development – two rows of two-storey tenement terraces, either side of a 36 feet-wide thoroughfare, with two ground-floor and two first-floor tenements sharing a common entrance. This was basic accommodation but each flat possessed its own sink and WC (though not yet a bath or hot water) and a shared backyard. The street – renamed Anita Street in the sixties when ‘Sanitary’ became less a badge of honour and more a taint of municipalism – remains solid and attractive housing, though much renovated of course. The Oldham Road area with the Victoria Square Dwellings to left. Sanitary Street forms the two centre rows of terraces with George Leigh Street to the rear. 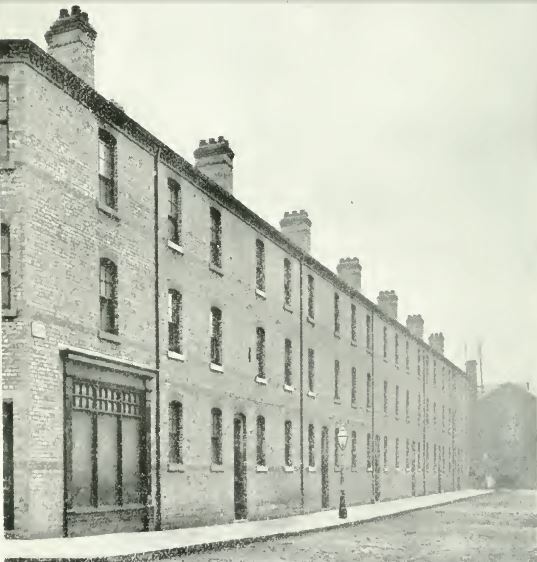 Similar accommodation was provided in two other schemes in Chester Street and Pott Street. But the Council’s most ambitious early scheme of tenement housing was George Leigh Street where 18 two-storey five-room cottages were built. These featured a third, attic, bedroom, allowing for the first time that girls and boys might sleep separately. more in keeping with an Englishman’s idea of home that he should have a cottage to himself, and not occupy a portion of block dwelling rooms. The reformers won out, aided by the economics at play. Land in inner Manchester was expensive – with a consequent impact on rents in schemes intended as self-supporting. At Oldham Road, the Council had paid over £5 a square yard; in the the city’s newly-acquired suburbs, it could be bought for a little over 3p a square yard. In 1904 the Council bought 238 acres on the new city boundary at Blackley for the sum of £35,643. It planned to build 203 two-bed and three-bed cottages, generally in short terraces but also including an experimental development of 22 semi-detached homes. Of the total, 171 included a bathroom. In 1910, progressive Liberal members of the Corporation even proposed a £400,000 garden city development but that would be blocked and it took a new politics formed by the First World War to launch the Council on its most ambitious out-of-town development – in Wythenshawe – in 1926. Marr himself would be commissioned in 1906 to direct what was in many ways the Council’s most effective intervention into working-class housing. Up to 1906 around 500 houses were being reconditioned each year; after 1906 that figure rose to 2000. At this time, the Corporation paid £15 per house to owners of back-to-back homes who converted them to through houses. By 1914 most of Manchester’s back-to-backs and courts had been cleared or renovated – the Council had demolished 27,000 slums and merged around 3000. (8) This was a record that placed it well ahead of most other industrial cities. It’s worth mentioning one other manifestation of city pride. 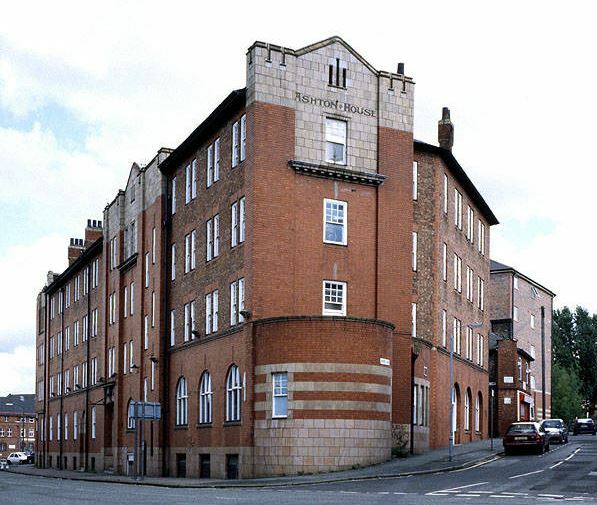 Ashton House, on Corporation Street, was the first purpose-built lodging house designed for women, opened in 1901. City Architect HR Price created an arts and crafts building of genuine quality, both in design and materials, housing in separate cubicles 222 of Manchester’s poorest inhabitants. 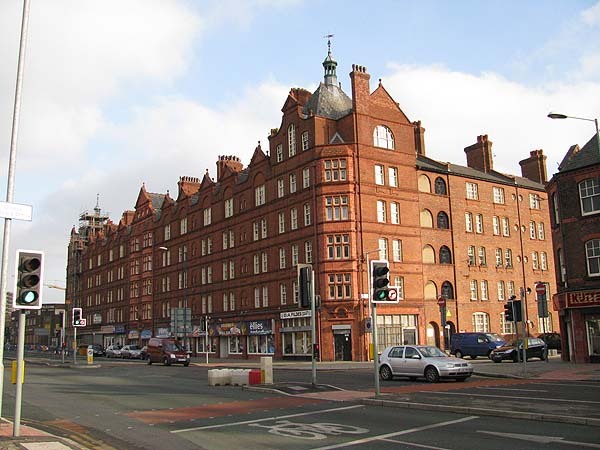 It remains a monument to early social reform though, now Grade II listed, it is currently providing hotel and hostel accommodation to visitors to Manchester. Much of the city’s early municipal housing was, by current standards, basic but this is a record of growing ambition and earnest endeavour. By 1914, a Manchester principle – the construction of houses rather than high-rise flats or tenements – had been established that would hold good for all but a brief period in the sixties when the ambitious redevelopment of Hulme was undertaken. That didn’t turn out so well and will be the subject of a future post. 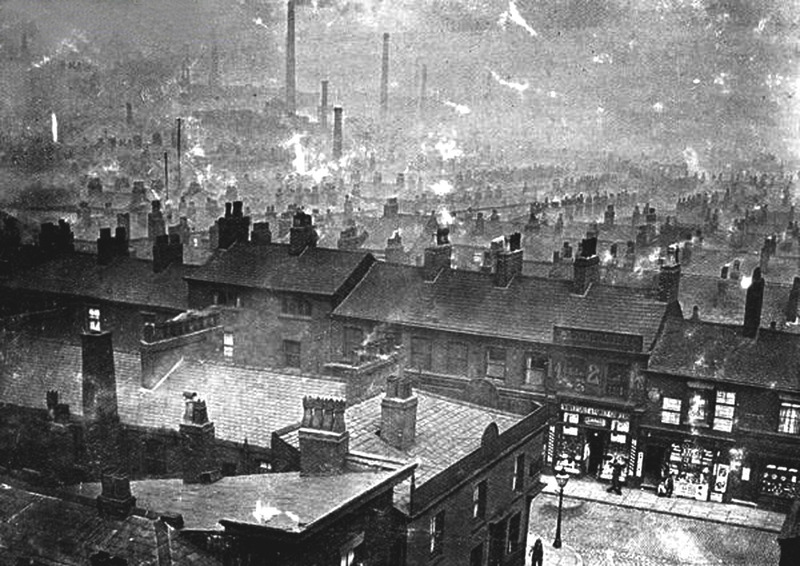 (7) Marr’s book, published in 1904, Housing Conditions in Salford and Manchester, contains a searing description of contemporary slum housing in the region and a rousing call to action. Early photographs are taken from Thompson, The Housing Handbook. Fascinating . Great to know more of the history behind the buildings. I’ve recently finished reading ‘The condition of the working class in England in 1844’ by Friedrich Engels, which is a fascinating account of both the conditions in the mills and the terrible state of the slums in industrial cities. 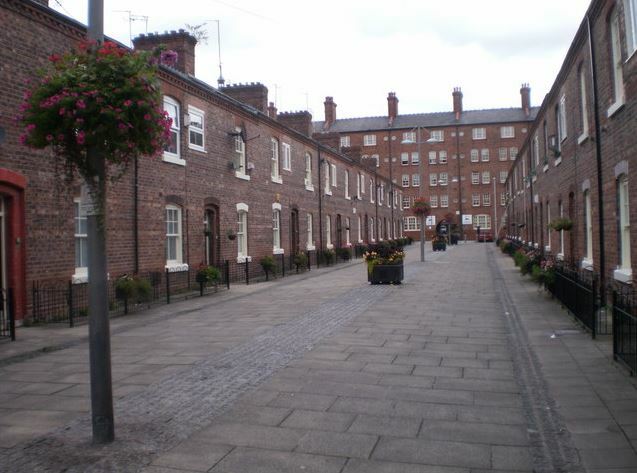 Engels was living in Manchester for while, so goes into particular detail about the dwellings there – definitely worth checking it out if you have the time. Thanks, Angela – and I note your interesting recent post on the topic. I think I did read Engels back in the day but definitely worth another look. Great article. I’ve added a link to our ‘City Fringe’ web page. Thanks – glad it will be useful. 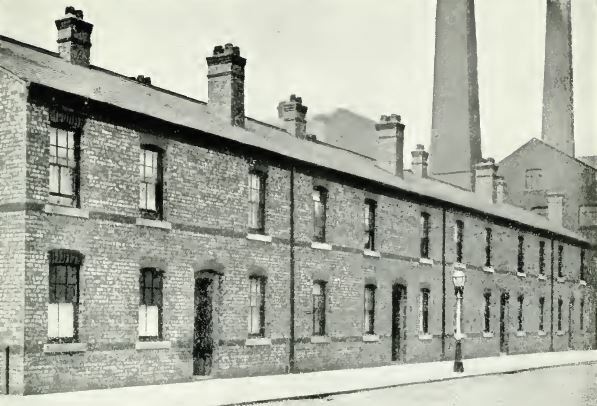 Chester Street Dwellings were in Chorlton-on-Medlock, not Ancoats. Thank you. I’m happy to correct the wording. Very interesting, especially with so many old photographs – I have included a link to this in the regular weekly round-up of the best housing features and blogs – please see http://www.cih.org/mycih/digitalhousing from Friday 21 Feb. Thanks. Glad to have made it to your august pages! Reblogged this on Donde me lleve la música..
Great post.. and indeed very relevant to my own families past! My late mum and all her brothers and sisters hailed from those very Ancoats streets. Mums dad, my Grandad, was born into a large Irish itinerant family(13 kids!) in the Angel meadow district off danzic street sometime In the late 1890’s. He in turn later met and married my grandma, who was herself born to Scottish/Italian parents in a dwelling just opposite the Hammer pub (Smiths arms).This being apparently not very long after he returned home invalided from the trenches of the Great war. My grandad Frank’s (Kilcourse) story is a remarkable one in itself.He was a huge man and incredibly strong. He worked as a porter for many years at the old Smithfield market after the war. It was here he gained the reputation as the ‘market strongman’. I still have an old photograph of him which was published in the Manchester evening news at the time, under the heading ‘Market strongman’. It shows him grinning, lifting an old heavy iron and wood porters truck above his head! It must have weighed a ton!! Apparently it also had a hundred weight of fish on it at the same time! All this,after surviving being part paralised/crippled in his spine by a machine gun bullet. He was to walk with a stick for the rest of his life. Remarkable really, considering originally being told that he would never walk again or be able to have any children! He later fathered nine!! They eventualy occupied two houses at the same time because they had nine children. One at 35 George leigh st directly opposite St Michaels. The other one close behind on Sanitary st (Anita st). My mum always spoke very fondly of her days growing up there in little Italy before and during the second war.They didnt have much apparently and there was a lot of mouths to feed. The community living about them was also very poor. But in spite of this,the poeple were intensly proud and very closely knit. When the family eventually moved on towards the end of the war my grandad took over the running of the old Wellington vaults (Marble arch) on Rochdale road. My mum remembers all the GI servicemen drinking there and members of the old church street barrow families like the Hamiltons being good friends and great customers at the pub. She also remembered quite clearly on several occasions her dad Big Frank chatting for ages with a small jovial chap at the bar. A man who other customers strangely seemed to shy away from. When in later years she asked about the man Frank told her it was Albert pierrpoint himself! Apparently he always called in for a pint when ever he had business at Strangeways across the bridge. What a fascinating bit of family history. Thanks for taking the trouble to share it and provide some additional colour to my blog entry. No problem! In fact I will dig out the photo of big frank lifting the market dolly and foraward you a copy. Its a really great pic! Reblogged this on green ice cream. Nice article. I think what’s also very interesting about the area is how the streets were transformed, very subtly, to encourage people to feel like they could walk in the roads and not just the pavements – making it a people place not a traffic place without officially having pedestrianisation. I love all the touches, like lowering the kerbs to be flush to the ground, very interesting but almost unnoticeable. Traced my family tree, the dwellings (Victoria house) and surrounding area as been my familys home from the 1700,s. Still have many good friends there. Everyone who lives in the dwellings now all speak of how lovely it is to live there.